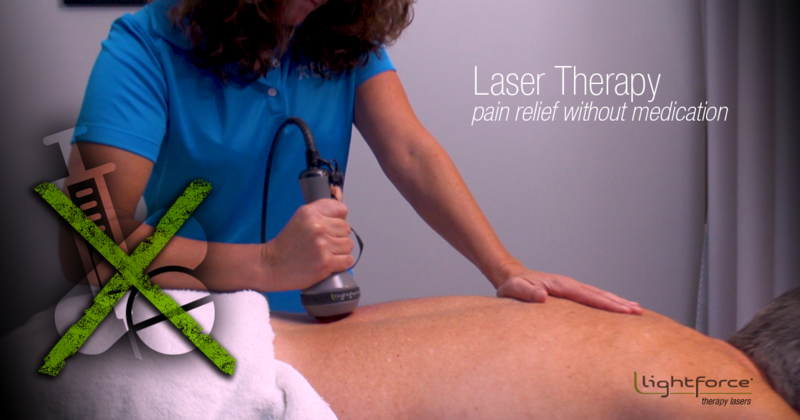 HomeFeatured NewsCan Laser Therapy Help the Current Opioid Dilemma? Can Laser Therapy Help the Current Opioid Dilemma? In 2016, 11.5 million Americans misused opioid medications which contributed to the death of 17,087 prescription drug users1. These staggering statistics have heightened the demand in the US healthcare market for therapies that address both acute and chronic pain conditions without the use of pharmaceutical therapies. Therapeutic laser, via the process of photobiomodulation (PBM), is a non-invasive modality that addresses pain in a number of ways. A 2015 study from the Annals of Cardiac Anesthesia demonstrated the effectiveness of laser therapy at reduced post-surgical pain after open-heart surgery. The painful sternal incision associated with this surgery usually requires oral opioids and rescue analgesia (injectable opioids), administered via a patient-operated button to self-control discomfort after surgery. The study looked at 100 patients that had laser treatment administered 30-minutes after surgery to the sternal area. Statistically significant pain reduction was noted at 1 hour and 24 hours after treatment. Only 40 patients had pain of 5/10 or greater 24 hours after treatment, which necessitated a second laser treatment. Pain was recorded at 0/10 for all patients by the third day (hour 54). No patients required a 3rd dose of laser, and of note, no rescue opioid analgesia was required for the laser therapy group11. This is significant because it demonstrates laser’s pain-relieving efficacy, and ability to reduce medication usage as part of the patient group’s multimodal (MMA) analgesia protocol. This is extremely important because even a few days of opioid use can lead to chronic dependence. A 2017 study that analyzed 1.3 million non-cancer patients showed that 6% of patients that used opioids for only 1 day were still taking the medicine one year later! The number doubled to 12% for patients that used opioids for 6 days, and for patients that were on a 12-day supply of opioids, 24% of those patients, almost one in four, were still taking the drugs one-year later12. Given that pain management is a multifaceted process, knowing what approaches are supported by evidence-based practice is key. In 2017 the American College of Physicians released its practice guidelines for Noninvasive Treatments for Acute, Subacute, and Chronic Low Back Pain13. In it, there was a strong recommendation for patients with chronic low back pain to initially select nonpharmacologic treatment. Several activities were recommended including exercise, multidisciplinary rehabilitation, acupuncture, mindfulness-based stress reduction, and tai-chi to name a few. The only stand-alone modality that they supported for chronic back pain was low level laser therapy. The Journal of Sport Physical Therapy (JOSPT) followed suit in 2017 by endorsing laser therapy among other treatments for use in treating both chronic neck pain with mobility deficits as well as acute neck pain with radiating symptoms14. These evidence-based guidelines for both neck and lower back conditions will hopefully encourage clinicians that are quick to dismiss modalities in their clinical practice to reexamine laser therapy. In doing so, they will find that there is growing support for it as part of a comprehensive plan of care when addressing pain and other musculoskeletal injuries. While drawing conclusions on the best way to address pain is still open for debate, a few things are starting to become clear. It is evident that the risks involved with opioids are causing them to fall out of favor for short and long-term pain relief. Additionally, the receptiveness by the medical community to prescribe non-pharmacological pain management treatment methods has never been higher. Knowing what active strategies, as well as how to incorporate modalities like laser therapy into a comprehensive, evidence-based plan of care, will be key factors in promoting change in the US pain market as the evidence on this topic continues to emerge. 2. Chow et al. Inhibitory Effects of Laser Irradiation on Peripheral Mammalian Nerves and Relevance to Analgesic Effects: A Systematic Review. Photomedicine and Laser Surgery Volume X, Number X, 2011ª Mary Ann Liebert, Inc. Pp. 1–17. 3. Holanda, V.M. et al. (2017) The Mechanistic Basis for Photobiomodulation Therapy of Neuropathic Pain by Near Infrared Laser Light. Lasers Surg Med. 2017 Jul;49(5):516-524. 4. Jimbo, K. et al. (1998) Suppressive effects of low-power laser irradiation on bradykinin evoked action potentials in cultured murine dorsal root ganglion cells. Neurosci Lett. 240(2):93-96. 5. Mizutani, K. et al. (2004) A clinical study on serum prostaglandin E2 with low-level PBMT. Photomed Laser Surg. 22(6)537-539. 6. Lopes-Martins, R.A. et al. (2005) Spontaneious effects of low-level PBMT (650 nm) in acute inflammatory mouse pleurisy induced by carrageenan. Photomed Laser Surg. 23(4):377-381. 7. Prianti, A.C.G. et al. (2014) Low-level PBMT (LLLT) reduces the COX-2 mRNA expression in both subplantar and total brain tissues in the model of peripheral inflammation induced by administration of carrageenan. Lasers Med Sci. 29(4):1397-1403. 8. Karu, T 1991, ‘Low-Intensity Laser Light Action Upon Fibroblasts and Lymphocytes’, in Calderhead, RG & Ohshiro, T, Progress in Laser Therapy, J. Wiley and Sons, Chichester, New York, Brisbane, Toronto, Singapore, pp.175-180. 9. Benayahu, D, Maltz, L, Oron, U, Stein, A 2005, ‘Low-Level Laser Irradiation Promotes Proliferation and Differentiation of Human Osteoblasts in Vitro’, Photomedicine and Laser Surgery, vol. 23, no. 2, pp. 161-166. 10. Abrahamse, H, Mathope, T, Moore, T, Mvula, B 2008, ‘The effect of low level laser therapy on adult human adipose derived stem cells’, Lasers in Medical Science, vol. 23, no. 3, pp. 277–252. 11. Karlekar A, Bharati S, Saxena R, Mehta K. Assessment of feasibility and efficacy of Class IV laser therapy for postoperative pain relief in off-pump coronary artery bypass surgery patients: A pilot study. Ann Card Anaesth. 2015; 18: 317-22. 12. Shah A, Hayes CJ, Martin BC. Characteristics of Initial Prescription Episodes and Likelihood of Long-Term Opioid Use — United States, 2006–2015. MMWR Morb Mortal Wkly Rep 2017;66:265–269. 13. American College of Physicians. Noninvasive Treatments for Acute, Subacute, and Chronic Low Back Pain: A Clinical Practice Guideline. Ann Intern Med. 2017 Apr 4;166(7):514-530. 14. JOSPT. Neck Pain: Revision 2017 Clinical Practice Guidelines Linked to the International Classification of Functioning, Disability and Health From the Orthopaedic Section of the American Physical Therapy Association. J Orthop Sports Phys Ther. 2017;47(7): A1-A83.